Hogs Breath Cronulla Steakhouse - Juicy Prime Ribs with an Ocean View! Delicious slow cooked prime ribs, overlooking North Cronulla Beach, Sydney, NSW, Australia. The Prime Ribs are always tender and cooked well over 18hrs. 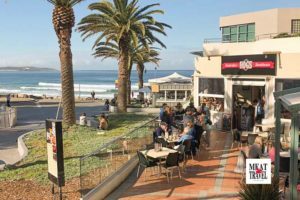 We are Cronulla locals, so we visit Hogs Breath Cronulla every now and again. In the past we would have rated it average, we could take it or leave it. Most recently (in the past year or so) the service and quality have improved considerably, so we’re there regularly. We don’t know whether it’s a change in the kitchen, suppliers or just overall. But the service now is excellent, friendly and fast. If it’s your birthday, they’ll even sing happy birthday to you. We almost always order the slow cooked prime rib. (Tip: Get the mega cut, and you get your drink free). The quality of the steak is middle of the road, but you cant expect a totally marbled piece of grass-fed Angus steak for under $100. What makes Hogs Breath prime rib so good is the time they take to cook it. 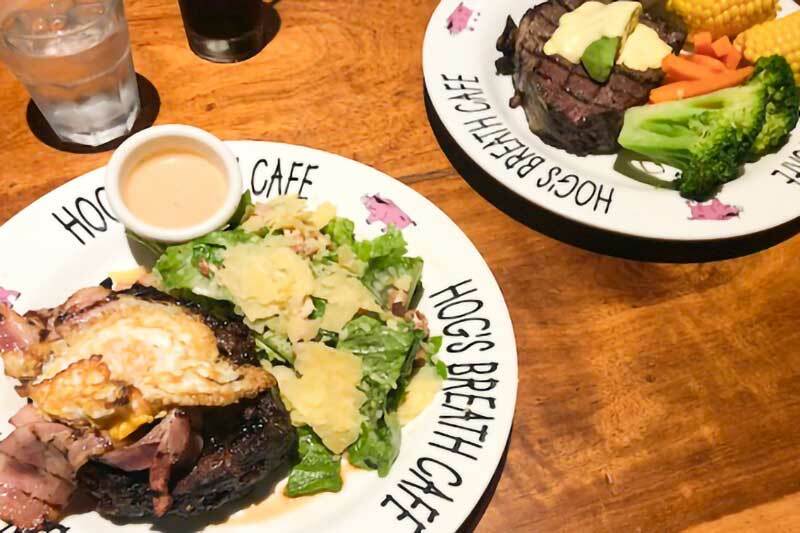 Hogs Breath cooks their Prime Rib over 18hrs, and it’s always succulent and juicy! It’s why we always order it. A Mega Cut Aussie Prime Rib served with Egg and Bacon with a free drink costs $45.95, and that’s all I needed! We’re not big dessert eaters; if our main steak dish doesn’t fill us up, we aren’t likely to come back (or review it). However, we’ve seen the desserts on their way to their destinations, and they do look good (and large). Often we visit at night, but lunch or an early dinner in summer is ideal if you want to take in the view and vibe of it all. Hogs Breath Cronulla also has lunchtime specials from under $10. You won’t find too many places where you can get lunch, a view of the beach and ocean for under $10. Hogs Breath Cronulla is located right on North Cronulla Beach; we love kicking back, taking our time devouring a steak and gawking about over the ocean. Do We Recommend Hogs Breath Cronulla? Yep, we don’t review places we don’t like and wouldn’t revisit. In fact, if we’re feeling like steak and don’t feel like going too far, Hogs Breath Cronulla is where we’re going. Note This is only a review of Hogs Breath Cronulla, we’ve been to other Hogs Breaths (not all) and some we just would not bother with again. (They are franchises, but you’re at the mercy of the owner and staff of each outlet). The steakhouses we do recommend are Hogs Breath Cronulla and Hogs Breath Terrigal. We also had a great feed at Surfers Paradise Hogs Breath recently. A note: This was not a paid review. Hogs Breath Steakhouse Cronulla - Juicy Prime Ribs with an Ocean View! Restaurant Description: Great slow cooked Prime Ribs, overlooking North Cronulla Beach, Sydney, NSW, Australia.The Prime Ribs are always tender and cooked well over 18hrs. Hogs Breath cooks their Prime Rib over 18hrs and it’s always succulent and juicy! It’s why we always order it. For under $100 Hogs Breath Steakhouse Cronulla gets a big thumbs up from us.